In Honor is one of those confusing books that you’re not sure whether or not to read simply because of all the mixed reviews. You do know for sure though that you’ll either wind up being one of those people who love it or one of those people who hate it. Unfortunately, I find myself in the latter position. For some reason, I expected In Honor to be very similar to Saving June. Both novels were centered around a road trip and at the core of their stories was a girl who had just lost a sibling. Yet, where Saving June was beautiful, moving, and poignant, In Honor was anything but. For Honor, whose parents were killed when she was young, her older brother Finn is all she is has. When Finn dies in Iraq, leaving Honor two tickets to a Kyra Kelley concert, she feels an indescribable urge to attend this concert and fulfill what seems to have been her brother’s last wish. Yet, what Honor doesn’t expect is for her brother’s ex-best friend Rusty to join her. Together, the two must embark on a journey across the dusty plains of the country and struggle to come to terms not only with Finn’s death, but with their own messed up lives as well. In all honesty, I don’t think this book can be described as a “road trip” novel at all. When I think of road trips, I think of stopping at random places, visiting unknown places, and getting involved with crazy groups. However, the “road trip” in In Honor revolves around the budding romance between Rusty and Honor. In fact, they simply end up driving around, getting caught in a storm, taking off their clothes in the extreme heat, and then chilling at Rusty’s mother’s home – some road trip. Needless to say, I found myself to be rather disappointed by the plot of this story and could not help making constant comparison to Saving June. The plot of this novel aside, I found myself unable to truly relate with or empathize with Honor. Although I didn’t have a sister who committed suicide like Harper in Saving June, Hannah Harrington made me feel as if I did. 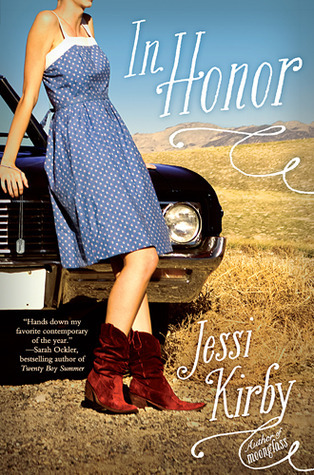 Jessi Kirby however, was unable to make me even sympathize with her protagonist; much less feel connected to her. If anything, I felt more sympathy for Rusty and what he was suffering as a best friend in some scenes (only, of course, to feel irritated at him later on). I really think I might have enjoyed this book if it had chosen to be unique by narrating this story from Rusty’s POV. His pain, torture, and confusion through losing his best friend somehow felt a whole lot more tangible to me than Honor’s grief. Still, I think the main problem I had with this novel all comes boiling down to its love story. In all honesty, I wish it wasn’t even there. I love romances, but this one felt strange, awkward, and all too forced. Furthermore, I think it would have been able to make a powerful message if Rusty and Honor had worked through their grief together as friends opposed to falling in love and thinking about how hot the other person was. I feel as if this came up so much that I just felt annoyed with the characters and the plot and this book in general. That being said, I think this story definitely had a lot of potential, but its execution ultimately fell flat. Perhaps I would have enjoyed this book more if it hadn’t reminded me of Saving June as much and inspired so many comparisons with it for me. Nevertheless, the fact remains that In Honor was not a book I could bring myself to fall in love with like many other readers. It was simply too cute, too cheesy, and lacked the type of depth and closure that I was expecting from it. If anyone is looking for a good novel about coping with grief, coming to terms with death, and falling in love, I’d recommend Saving June and simply skip this one – it just doesn’t compare. In modern times, it is not only the mother who feeds, dresses and bathes the child. In some cases, universities are known to consider your work experience toward academic credit, which means your cost and time to complete your degree reduce substantially. Hospital Nursing Assistant Training Toledo Oh The role of a Nurse Practitioner is to provide quality care and treatment for patients with both acute and chronic health care conditions.